R. L. Waterstone marks her publishing debut with the release of “Chronicles of Collandonia” (published by Trafford Publishing), a novel charting the adventures of an unlikely hero to bring the dawn of change. Royal Governess, AnnaLusia, has a premonition that trouble is looming. Unbeknownst to her, Voerlow’s new king, Kellup, has plans that embody peril for Xelphea, Ammyl and Perlador. King Kellup seeks to acquire magic powers from King Holden of Ammyl, but Holden is suspicious of Kellup’s intentions, and refuses to oblige. When Queen Delshanna of Xelphea vanishes on the night of a celebration ball, King Avander is distraught beyond measure, and AnnaLusia is discovered missing as well. While King Avander searches far and wide for his queen, with King Holden’s support, an unlikely champion steps in. Determined to reunite them, he proves that a person’s destiny is not set in stone, and unintentionally takes his place in the ancient prophesy, and so begins the dawn of change. After resettling in the United States, R.L Waterstone began to work on what she had found inspiration to write while living in England. 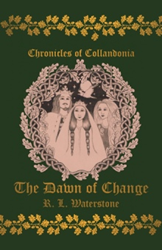 "Chronicles of Collandonia: The Dawn of Change" is R.L. Waterstone's first novel.